Hindus do not have a history of invading other countries. They have not sent missionaries to other countries preaching to them that their own religions are evil and trying to persuade or intimidate them to adopt Hindus beliefs. They have not economically exploited other countries as their colonies. They have never said that Truth or God belongs only to Hindus and those who believe otherwise are unholy or sinners. Hindus have a history of tolerance and respect for all religions, which is almost unparalleled in the rest of the world. Yet we find that in the news media, including that of India itself, anti Hindu attitudes are common. Hindus are spoken of in negative way that is not done relative to religious groups whose behavior has been more violent, exclusive or oppressive. Anti-Hindu statements appear to be acceptable to everyone and no one questions them very much. Let us take the Ayodhya incident in December of 1992. Newspapers throughout the world stated that “Hindu Militants Destroy Mosque,” projecting the image of Hindus both as militants and as mosque destroyers. But what really took place and what is the history behind it? The sophisticated nature of Hindu philosophy, psychology and cosmology are generally ignored. Hindu groups involved did demolish a building that was built by a Muslim invader from Central Asia some four centuries ago, and the building had been used as a mosque, but not for over fifty years which was the last time Islamic worship was performed there. In recent years the so called Ayodhya mosque, Babri Masjid, has only been used for Hindu worship, and it has contained Hindu religious statues in it since 1949. The structure was not originally constructed in the style of a true mosque, lacking minarets and other architecture of a typical mosque. Above all, the site was claimed by the Hindus as the original location of a great Hindu temple to Lord Rama, one of the Hindu Divine incarnation, that was first demolished for the building of the mosque or victory monument by invading Muslim armies. Hindus, and Sikhs we might add, fought dozens of battles over the centuries to reclaim the site and succeeded several times in holding it under their power. The site was not in any Muslim holy place like Mecca or Medina but in one of the seven sacred cities of the Hindus. Calling the site a mosque is thus inaccurate. It should have been called a “disputed structure,” which is how newspapers in India generally designate it. Yet the press did not say that “Hindus destroy a disputed structure in their sacred city of Ayodhya, which Moslems had not used as a mosque for fifty years,” because this would not have been much of a story. The result was that the press not only misrepresented what the Hindus had done but inflamed Islamic sentiments, which added fuel to the riots that followed, which were mainly initiated by the Muslim community of India on the belief that one of their sacred sites had been wrongly desecrated by the idolatrous Hindus. We find that in the news media, including that of India itself, anti Hindu attitudes are common. Hindus are spoken of in negative way that is not done relative to religious groups whose behavior has been more violent, exclusive or oppressive. During the Islamic invasions of India-which were not provoked by any Hindu attack on Islamic lands and which lasted for over a thousand years tens of thousands of Hindu temples were destroyed, in fact most that existed on the subcontinent. The many great temples that Chinese travelers in the seventh century saw throughout India, which were not only Hindu, but Buddhist and Jain, cannot be found today. These temples were not abandoned suddenly, nor did they disappear of their own accord. The invading Muslims willfully destroyed them in an attempt to before Hindus to convert to their faith, or to steal the jewels that Hindus temples abound in. 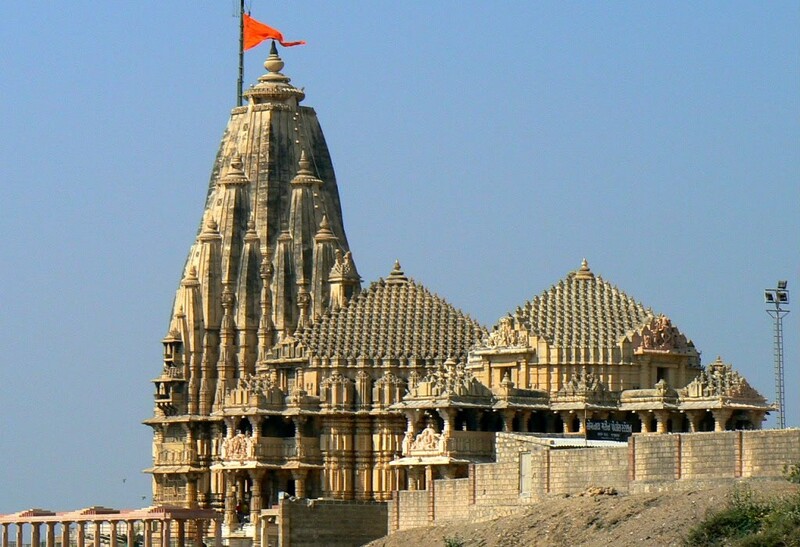 The most sacred temples of the Hindus, like those built on the birthplaces of Rama and Krishna, were special targets. Not only were temples destroyed they were often replaced with mosques, converted into mosques. The temple deities were often buried at the entrance of such mosques so that Muslims could trample over them as they entered into their mosques, thus humiliating the Hindus further. The cruel history of the Islamic invasion of India which involved massive genocide and enslavement of Hindus-is not known by many people, particularly in the West where the history of Asia is not regarded as very important. Some would like to pretend that it didn’t exist at all, or that the scale of atrocities was really very small, that its intentions were not religious conversion but military conquest, or that being a thing of the past we ought to forget about it today in order to protect communal harmony in the country. India partitioned itself in 1947 in favor of the Muslim minority, which claimed that it could not live in a Hindu majority state. In the process the Hindu temples left in Pakistan were taken over by the Muslims and frequently destroyed. Even the governments and armies of Pakistan and Bangladesh at times have participated in such Hindu temple destruction activity. The real history of India is thus one of Hindu temples being routinely destroyed by Muslims on a massive scale, and yet this is seldom ignored. On the contrary, the image of Hindus as mosque destroyers was portrayed, not that of Muslims as temple-destroyers which is a much more accurate depiction. At the same time as the Ayodhya demolition, and in retaliation for it, dozens of Hindu temples were destroyed in Pakistan and Bangladesh. Some were attacked in Great Britain and other countries outside of India as well. Yet such stories were treated as more footnotes to the Ayodhya mosque destruction, as if the Hindus were responsible for them by what they did with one disputed mosque, and Muslims were not responsible for their own actions once provoked by Hindus. If we look at how the news media treated the event it appears that one Hindu demolition of a disputed mosque is more news worthy and an expression of greater intolerance than Islamic destruction of any number of Hindu temples. Is this not prejudice and an anti-Hindu attitude of great proportions? Why is the destruction of Hindu temples not a newsworthy items, but the destruction of one disputed mosque worth global headlines? In fact Muslims also destroy the mosques of other Muslim sects, like the Ahmadiya mosques which have been destroyed in Pakistan, and this is not treated as a news worthy item either. The real question that should have been asked after the Ayodhya incident was why did Hindus finally take to this demolition, when for over a thousand years they have allowed their temples to be routinely destroyed and turned into mosques with little retaliation? The question itself provides the answer. Whether one approves of the act or not, such a history can create a sense of injustice for which revindication may be sought, particularly if it is not addressed through legal means. The news media also failed to give importance to the fact that the Ayodhya dispute had been in the court of India for over forty years, with no decision as to whether the structure was really a mosque or a temple that had been stolen. Hindus, like many other oppressed peoples, appear to be waking up to the history of their oppression. Like other racial, religious or sexual oppressed groups, this awakening involves a release of anger or hostility which can appear extreme and is certainly contrary to what has been their normal behavior. Yet it can hardly be simply condemned as the news media appears to be attempting. It is part of a process of rectification that will eventually find its balance. Given the modern age of information, wherein the facts of history are known, and wherein oppressed groups of all types are awakening and seeking to gain equally, we must expect that Hindus will also go through this process. Westerners may not be accustomed to regarding Hindus as an oppressed group, but if we examine the history if India we see that Hindus have been subject to racial and religious oppression, along with economic and military aggression since the Muslim invasions of the eight century, followed by the actions of the Portuguese and the British in the colonial era. So far modern India has not yet adequately dealt with its past. What should really interest us is not why Hindus took to this demolition but how Hindus could tolerate the massive destruction of their temples for centuries with such forbearance. This is an act of tolerance unprecedented in Western history. That it should now appear to be coming to an end should not shock anyone. The real wonder is that it lasted for so long. The issue should get us to look at the historical grievances of the Hindus, which they are certainly entitled to claim. Even if one regards the Ayodhya demolition as wrong, its hard not to feel some sympathy with Hindus historical grievances on these issues once the matter has been studied thoroughly. To examine the issue of anti-Hindu attitudes in the press further, let us compare how India is treated with how two other countries are treated. The first is Saudi Arabia in which all religions are illegal except for Islam. Other religious practices are not allowed except in private and for foreigners only. There is no difference between church, state and police, which is all run according to traditional Islamic law. By all accounts Saudi Arabia is an intolerant fundamentalist state. It has funded various Islamic fundamentalist and terrorist groups all over the world through the years. However Saudi Arabia is called a “moderate” Islamic country. If Hindus were to try to do in India, even a small portion of what the Saudis have done in their country, the world community would be appalled and might even take up arms against them. Why is Saudi Arabia treated specially? The answer is very simple, because the world dependency on Saudi oil. Economic need fashions the global press and structures global ethics. We can ignore the intolerance of those whom we want to have good business relations with. Since the Western world, which dominates the mass media, has little economic need for India, India is treated unfairly in the press (though with the economic liberalization of India and more interest in Indian economically by the West this may charge in time). There is no need economically to cater to the Hindus, and no threat of Hindus retaliation economically or through terrorism, so they can unfairly condemned or bullied. Next let us compare how India is treated relative to that of China, a communist dictatorship, whereas India is a democracy. China has long held the most favored nation trading status with the United State, in spite of the Tienanmen massacre in Peking a few years ago. Anti-Chinese attitudes are seldom found in the press. Chinese are seldom criticized for militancy and no real action is taken against them even though they sell weapons of mass destruction and nuclear technology to other countries and have had an ongoing campaign of genocide of the people of Tibet. Why China treated differently than India? It appears also to be potential economic gain, as well as fear of China’s size and power. It is curious to note how humanitarian issues follow economic imperatives and that countries which are economically valuable can be easily excused for their violations of human rights, while countries that have little economic importance can be either ignored or denigrated. Next, let us compare how the Hindu minority is treated in Islamic countries with the treatment of the Islamic minority in India. Pakistan eliminated its Hindu minority long ago through forceful conversion or genocide. There are almost no Hindus left in a land which before partition had a significant minority of them. Yet hardly any one even cares to mention this fact. The Hindu minority in Bangladesh has been continually oppressed and dispossessed of its property, and is therefore dwindling in number. Yet the global press does not mention this either. While it has been recognized that the genocide in Bangladesh in 1971-72 was one of the worst in history and numbered over three million people, the press seldom mentions the fact that it was mainly who were killed. Hindus in work in Arabic countries are not allowed to practice their religion in public and yet no country, including India, protests this, though non-Hindus working in India are certainly not prevented from public worship (and would certainly protest fiercely if this were attempted). On the other hand, though Muslims may be subject to some degree of discrimination in India and are certainly very poor, their numbers have grown, and many Muslim immigrants have come to India form Bangladesh, several million. Clearly India has not stifled Islam the way Pakistan and Bangladesh have stifled Hinduism. India has allowed Islam to increase within its borders, while Pakistan has all but eliminated Hinduism from its. More over India has more Islamic sects than any Islamic countries, with some, like the Ahmadiya who have been made illegal in Pakistan taking their refuge in non-Islamic India! Yet the Ayodhya incident proclaims Hindu Mistreatment of Muslims and does not mention the much greater Muslim mistreatment of Hindus. It appears that Hindu mistreatment of Muslims is a newsworthy item, while Muslim mistreatment of Hindus, even on much larger scale, is not. In countries like Pakistan or Bangladesh Hindu temples can be destroyed or taken over easily. They have no government protection like mosques in India. Hence it is not an issue if temples are destroyed in the normal course of things, and cannot possibly provoke any national crisis, as is the case in India. Why is there such of disparity of treatment? The greater number of Islamic countries and the influence of petrodollars is certainly part of this, as is the clearly of Islamic terrorist retaliation. India’s own lack of concern of Hindus in other country is another factor. This often goes back to leftist and Marxist influences in India who are opposed to the Hindu religion which is their main political opposition in the country. The Western press also proclaims Hinduism as polytheism and idolatry, not as monism and spirituality, which it really is. Hindu practices of Yoga and meditation, its seeking of cosmic consciousness and view of Self-realization as the highest goal of life, and its many great modern sages like Ramakrishna, Aurobindo, and Ramana Maharshi are seldom given any credit. The sophisticated nature of Hindu philosophy, psychology and cosmology are generally ignored. Western news media accounts of India generally focus on such social evils as the caste system, mistreatment of women and dowry deaths, without showing the deeper side of Hinduism. This would be like representing American culture through drug addiction, sexual promiscuity and divorce courts and ignoring the other aspects of the culture. Or if the spiritual teachings of India are mentioned, they are regarded as “cults,” even though they have been the fabric of one of the greatest civilization of the world through history. It appears that any religious teaching not part of traditional Western culture is liable to be called a cult in the Western press, particularly if it gains any following. How would Western people feel if predominant Western religions were called cults in the Eastern world? How would Christians feel if the news media of India called Christianity a cult? Christian missionaries in India have broken up families and sowed distention in Hindu society far more effectively than any so called Hindu cult leaders in the West. The Waco Texas incident in 1993, in which ninety followers of Christian cult leader David Koresh were killed, has been used to attack Hindu and other Eastern religious groups in America as cults, in spite of the fact that Koresh, like Jim Jones, the other recent cult leader who led great numbers of his followers to death, was a Christian ! Some Hindus themselves claim that Hindus must be subject to a higher standard, that their religions may accept or even promote. Hence oppression of Hindus does not bother them as much as Hindus oppressing non-Hindus. Yet to create a higher standard for Hindus does not mean to misrepresent their behavior relative to other groups. We cannot say that temple destroying is alright for Muslims because it is part of their religion, but reclaiming mosques built on Hindu sacred sites is not right for Hindus who should follow a policy of total religions tolerance. There must be one standard for all human beings. The higher standard of tolerance in the Hindu religion does not mean that anything that suggest intolerance among Hindus should be broadcast to the global media as a great evil, while intolerant actions among other groups, particularly against Hindus, should be ignored. There should be a common standard for all humanity and Hindu groups should not be especially attacked, while other groups are ignored or excused for what may be more violent or intolerant behavior. Hindus need not be given any special favorable treatment, but the special unfavorable treatment of them which now exists should come to an end. Hindus should be portrayed not just for what the Western mind finds wrong with them but as they are. The full extent of Hindu culture, religion and spirituality should be made known. Given all this, it is imperative that anti-Hindu attitudes are questioned. They are a form of ethnic and religious discrimination, which should be unacceptable to any open minded person. As long as such negative attitudes persist in the press they can only further misunderstanding and disharmony. Yet the place where they must be changed first is in the English language press of India. We cannot expect the global press not to follow anti-Hindu attitudes that come from India itself. And India can never rise up as long as it is attacking itself. As a Westerner who has studied the deeper side of Hinduism and learned how much Hinduism is misrepresented and misunderstood. I have been compelled to speak out on these issues. Greater communication on these issues would probably go far in correcting this anti-Hindu prejudice. Given the extent of the problem it will take time to correct and the vested interests who are opposed to it will not give in easily. However there are now those who are presenting the Truth and the old distortions will no longer go unchallenged. In closing, I am not saying that Hindus have not done anything wrong or that there is nothing questionable about Hindu political groups or social practices. Hindus must take it upon themselves to reform their society, which is badly needed, but this should be done according to the soul of India, which is Dharma, not according to Western political, intellectual or religious ideologies, which are generally adharmic, that is unspiritual, however modern or well-funded they may be.